Christmas #1 – Advent Calendars | Its a Hard Nut Life . By now i’ve figured out that the majority of my readers are now allergy mums and a couple of friends in a flat in London! So I thought i’d try out one for the mums. This post is all about buying advent calendars and how to ensure that your child/teen gets a nice treat on the 1st of December and doesn’t have to eat raisins or something! For years and years, I used to get two advent calendars a year. Now I know what you may be thinking (“Someones spoilt!”), but no, well not really. I used to receive an advent calendar from my lovely mother and from my granddad. They would both buy me a calendar each made by the same company. Now, this company (Kinnerton) are, I believe, the only large company in the UK that made commercial chocolate advent calendars that can actually be eaten by N.A.S’s! Shocking I know! Only one company! But, having said that, their calendars are great and the chocolate is pretty good too. So every year I’d receive two of these special nut-free calendars from my mum and granddad. I was given them on the 1st of December and used to love them! I loved them because it was one of few traditional holidays that I could sort of join in with. They made calendars with cartoon characters and children’s things on them, so naturally growing up, they were great! When I hit 12, things changed a little bit. That following December when I received my advent calendars, I got a Bob the Builder one and a Simpsons one. As always the chocolate was great and I still enjoyed cracking them both open every morning and having a little treat. It was only when I got to school that things changed. All of my school friends used to get regular Cadbury calendars or Nestle treats. I was the only one that was different. I’d received these calendars that were essentially for young children and I knew that people might laugh at me or make fun of me if I told them about them. So I didn’t. I was embarrassed. I might have even lied to them, I don’t remember everything. I do remember feeling rubbish and because I was too young to realise that an allergy didn’t make you weird or strange, I acted like an embarrassed pre-teen. It was only when I began to get older that people stopped caring what type of advent calendar they received and just cared about the chocolate treats inside them. Naturally, for several years to come, I’d always wish that there were alternatives and that I could get a different calendar, but at the end of the day it didn’t matter. I still receive my two kinnerton calendars every year. (Last year I got Peppa the Pig and Iron Man!). I don’t mind, it used to embarrass me when friends came over and would see them or when I was asked what I had received. But now I don’t care, I don’t have anything to be embarrassed about because all I care about is the chocolate! …so long and winding story over, let me get to my point! There will be hundreds and thousands of children that will receive their Kinnerton advent calendars this year and there will be plenty that will inevitably be embarrassed or ashamed. So for you parents out there buying your children calendars, I put together a few guidelines and tips to help you think about what they’d like and what might embarrass them less! Enjoy! Reusable Calendars: This is one particular method that I know a lot of sufferers use (particularly older ones). If you buy a nice wooden calendar or reusable calendar, every year you can fill the little boxes with treats that you can eat and enjoy! No more looking at packets or scouring shelves to find a suitable calendar, just buy a wooden one and reuse it every year. It will work out cheaper and there won’t be any stigma or embarrassment because what’s weird about it eh? Alternatives: My mum tried buying me a really nice box of chocolates once and i’d eat one of those each day. 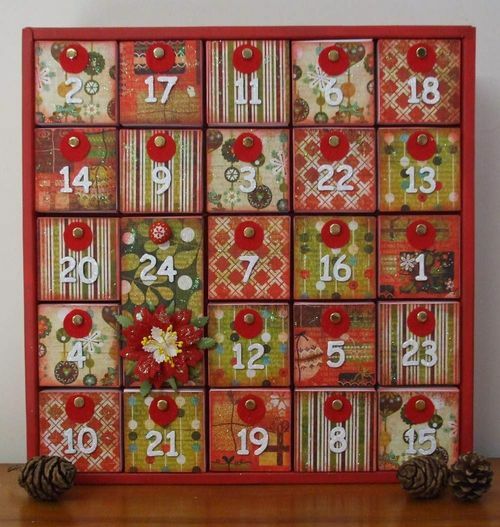 A great simple alternative to making, buying or worrying about advent calendars. So anyway, I wish you all the best of luck finding advent calendars and I’d really appreciate knowing some of your own methods and tricks if you use any. As always, thanks for reading and there’ll be more updates soon!